The simplest thing to cook over (or in) an indoor fire is probably chestnuts.? You can buy a special chestnut roasting pan, which has holes in the base, or simply wrap them in foil and place in the embers.? This latter method has the advantage that if the chestnuts do burst they won’t fly out of the fire.? To help prevent bursting you should slit each chestnut with a sharp knife before they are cooked. The next simplest and quickest thing to make is Drop Scones.? These are risen with baking powder rather than yeast, so the batter must be baked immediately it is mixed. Set a lightly greased griddle or heavy based frying pan (preferably cast iron) over the fire or stove to warm. Sift together all the dry ingredients, then beat together the egg and milk.? Make a well in the centre of the flour and pour in the milk and egg mixture.? Gradually incorporate all of the flour to make a smooth batter.? Drop dessertspoonfuls of the batter onto the warm griddle and cook until bubbles appear on the top.? Flip them over and cook for the same amount of time on the other side (about 2-3 minutes a side).? Remove to warm plate and cover with a cloth until you have made a batch, but serve as soon as possible with butter and/or honey. When I was a child we bought crumpets and I loved them.? Something changed, and flaccid bought crumpets no longer hit the spot.? For several years I stopped eating them altogether and then I had a go at making them myself – it was well worth the effort.? 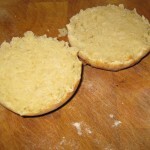 When making bread I avoid easy-blend yeast with its added ascorbic acid, but crumpets are a fast risen batter anyway.? Baking Powder and Bicarbonate of Soda were not used in baking until the 1920s so crumpets would originally have been risen by yeast alone.? However the addition of a small amount of Baking Powder (I find the mixed preparation has less taste than bicarbonate of soda on its own) just before baking helps the rise and makes for lighter crumpets. Put the flour in a bowl and mix with the yeast, salt and sugar.? Make a well in the middle and pour in the warm milk and water mixture and vegetable oil.? Beat together to make a thick batter.? Leave to rise until it has about doubled in size (1-2 hours). Put a large frying pan or griddle over a very low heat.? Whilst this is heating dissolve the baking powder in2 fl oz of warm water and beat into the batter. When the pan is hot enough that a drop of batter would start cooking immediately, but not so hot that the crumpets will burn, brush the base and inside of metal rings (plain pastry cutters will do) with vegetable oil.? Spoon in enough batter to cover the base of each ring, letting it find its own level.? Don’t make them too thick. 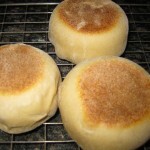 Cook the crumpets until they are dry and set on the top – this can take 10 minutes or more.? During this time bubbles should appear on the top but towards the end of the cooking time you can use a skewer to help them burst as otherwise the crumpets, though tasty, will be “blind” and won’t absorb butter, which is an essential part of the eating experience. Turn the rings over to cook the other side for a couple of minutes; it does not matter if they are not actually touching the surface of the pan, although you should be able to ease them away from the sides of the ring with a palette knife. When the bubbly side is lightly browned remove the crumpets out completely from their rings and leave them to cool and set on a wire rack. Toast and butter the crumpets before serving. Pikelets are the Yorkshire version of crumpets, essentially made with the same batter although perhaps a tad looser, and cooked without a ring.? 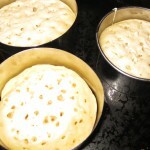 This means that the batter spreads and the finished pikelet is much thinner than a crumpet. These are made with a stiffer batter than crumpets and are baked without rings.? They do not have holes.? They are made almost like buns but then baked on a griddle rather than in the oven – which is a fascinating process that requires a leap of faith the first time you do it. 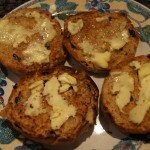 There are strong opinions about how they should be buttered, definitely not split and toasted.? According to Marian McNeill the correct way to serve them is to open them slightly at their joint all the way round (some say to snip with scissors but I score rather than cut them with a bread knife), toast them back and front, then tear them open and butter the insides liberally. Sift the flour and salt into a bowl, then cover and place in a very low oven to warm.? Meanwhile mix together the milk and water (or use all semi-skimmed milk) and warm until just tepid.? Cream the yeast and sugar with a little of the warm milk (or if using easy blend yeast you can add it directly to the dry ingredients). Make a well in the middle of the warmed flour and pour in the yeast liquid and olive oil.? Mix with a wooden spoon and then turn out onto an oiled surface to knead.? The dough should be very soft and slack, but not sticky.? When smooth, put the dough back into the bowl, cover and leave until doubled in size (an hour or so). Divide the dough into eight and shape each piece into a ball then flatten slightly with the heel of your palm.? Dust all over with rice flour.? Put them onto a well-floured tray and cover with a cloth for 40 minutes or so until they have risen again. Heat a skillet until hot but not red hot as you would for meat, then transfer the muffins very gently so that you do not knock the air out.? Cook gently for about 8 minutes a side.? They will look floury, pale golden-brown but white waisted and should be anything up to 2” (5cm) thick.? Serve as described above. These are baked in an oven, rather than cooked on a griddle, but they are toasted before being eaten so this could be done in front of an open fire. Heat the milk until tepid, pour into a mixing bowl and sprinkle on the yeast.? Leave for 10 minutes to check it is active (this is not necessary for fast acting yeast). Mix together the two flours, salt and mixed spice.? Rub in the cubed butter, then add the sugar and currants.? A food processor is handy for this stage, just do not process with a metal blade after the currants have been added – the aim is just to mix everything together. Beat the egg into the milk and yeast mixture and then add the dry ingredients.? It will seem a little sticky at first.? Leave it for 10 minutes or so and it should be easier to knead.? Knead until the texture is silky. Cover the bowl and leave in a warm place until doubled in size (an hour or so). Divide the mixture into eight even sized balls.? Place on a lined or greased tray and flatten slightly with your hand (a 10 cm ring is useful for making them all even sized and neat, but is not essential). Cover the tray and return to a warm place to puff up again whilst you heat the oven to 200?C/Gas Mark 6 (this will take about three-quarters of an hour). Bake for 15-20 minutes until golden brown.? Whilst the teacakes are cooking prepare the glaze by heating the milk, stirring until the sugar has dissolved, then boiling for about a minute until lightly syrupy. 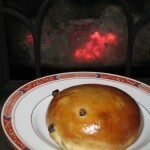 Brush the teacakes with the glaze as soon as they come out of the oven.? They can be eaten as fresh but they taste even better split and toasted the following day. This entry was posted in Food Culture, November - Recipes. Bookmark the permalink.